If you read my blog post about my day out at Thorpe Park, you’ll know that I was made to feel pretty embarrassed by some random guy that I’d never met before in my life. Like any other person, I wanted to feel comfortable whilst going on rollercoasters and was not going to wear clothes that restricted me in anyway. But at the same time, I’m still not able to wear jeans for too long, especially on rides; where the jeans could dig in to my stomach if pressure was to be put on them. Leggings also weren’t an option as they again don’t support my stomach. I hadn’t been clothes shopping since surgery and had been living pretty much in my pajamas, so my only option that day was my cotton, high waisted shorts – they are thick and easy to move around in, they have a chunky waist band which supports my stomach really well. I’m also able to hide extra padding under there due to the amount they stretch. That day, I felt pretty confident. I was sure I’d be okay on the rides, I felt good within myself and I knew my bag was so well supported that the chances of anything going wrong were thin. I hadn’t even thought about my choice of clothing. I was just ready to enjoy myself! I was wearing black tights with my shorts and ankle boots, with a baggy jumper over the top and a denim jacket. I was so covered up that when I was approached by some random guy, I was completely bewildered by what happened next. This guy took it upon himself to chase after me shouting “excuse me, excuse me! !” at the top of his voice, causing any people passing by to stop and stare. His girlfriend followed behind him laughing at me in a malicious way, as he literally ran after me. Causing such a scene. This guy was in his thirties, I’d say. Of course, I stopped, thinking perhaps I’d dropped something. I turned to acknowledge him, and with a smirk on his face, he loudly asked me “are you wearing anything under that jumper? !” red faced and slightly confused I replied “of course I’m wearing shorts..” he laughed and asked me “are you sure? I wasn’t sure if you’d forgot to put something on this morning?” I quietly told him “these are the only things I could wear today” as he continued to laugh at me, still very loudly, and walking away saying “alright I just had to check”, whilst other people watched me wanting to dig myself a hole and hide in it. The man walked back to his girlfriend, and they both followed behind me and my friend, laughing at me. Of course my friend stood up for me and told him “if you knew the reason, you’d wished you’d never done that” but of course, he didn’t know the reason, and I wasn’t going to explain myself to him. I tried to block out what had happened and enjoy the rest of my day, but I couldn’t help but feel like people were staring and laughing at me as the day progressed. I wish I had said something then, I wish I’d stood up for myself. But I was so lost for words! He made me feel conscious of something I hadn’t given much thought that day, I wasn’t bothered how I looked.. I just wanted to feel comfortable. So, to the guy that took it upon himself to point me out in front of a bunch of strangers and laugh in my face, over something so insignificant, let me ask you..
Did you ever stop to ask yourself whether it was appropriate for you to walk up to a complete stranger and mock them? Did you ever stop to question my outfit choice, and wonder if perhaps there was a reason? No? Well let me ask you this, would you ever point and laugh at somebody in a wheelchair, and demand to know WHY they put on the clothes they did that morning? No, of course you wouldn’t. Because any decent person would take note that they possibly have good reason to wear what they are. So why was it appropriate to approach me in such a rude manor? With such negative intentions? Is it because I look like any other abled person? Because you cannot see my disability? Just because you cannot SEE a disability does not give you the right to treat me or any other person with such disrespect. That is not okay. Abled or not, it is not okay to treat any body in that way. You are the exact example of what is dragging todays society down. Choosing to pass judgement on somebody you don’t know, purely because of what you see. The actions you chose are the actions that effect a persons self confidence. I hope to think that if we had explained my choice of clothing that day, you would have shown a little empathy. But it shouldn’t take an explanation to stop you humiliating someone. I’m glad that you mocked me only on my clothes, but it strikes an important message that it could’ve been worse, and some people experience that. And that’s disgusting. Whether you have a reason or not, it’s never fair to be made to feel 2 inches small. Sadly, there’s always going to be people like you out there thinking they have the right to put another person down. Thinking making fun of somebody else makes them a comedian. But in future, just think. Because words hurt. Hattie, sadly there are many utter idiots (male, female, young, old) running around the place with nothing better to do than to try belittling people. Normally I would just tell them to Foxtrot Oscar in no uncertain terms and then carry on. Sorry that you had to experience this and hopefully you’ll not be put through anything similar in the future. 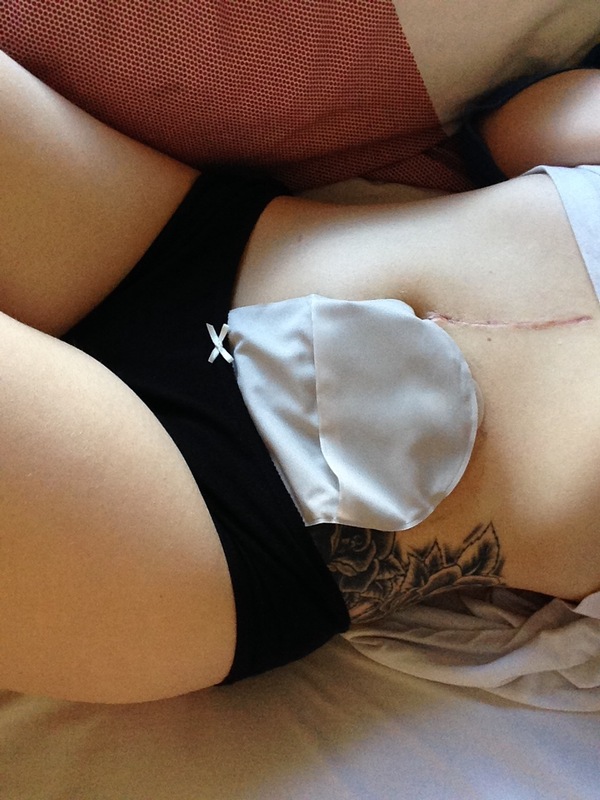 I have FAP (Familar Adenomotous Polyposis) and recently had to have my 2nd Ileostomy. It takes time getting used to having a Stoma again and all that goes with it. Getting clothes that are comfortable can be a real nightmare to say the least. I wear what I feel comfortable in and to heck with what anyone else thinks.